Hi Folks! It's been great seeing so many of you playing with the Winnie & Walter Belated 2nd Birthday Challenges! Just wanted to remind you that this is the last day to link up your projects. With a $75 gift certificate up for grabs at EACH of the 10 challenges, there's a lot to gain here! Here's a card that I didn't post with my Over the Edge Challenge since I liked the other two better. But it's still worth sharing! I gave this card to our neighbors for the enormous tray of goodies they gave us at Christmas, which is why I used the houses to create a neighborhood on the card. Sometimes I tend to skip the smaller stamps in a set, like these evergreen trees, but whenever I use them I always think it would not look the same without them. Also interesting to note, the sun's rays are from the Christmas Peppermint Zone Creative Screening. Love getting more use out of holiday supplies! Hi Folks! We've saved the best for last today! 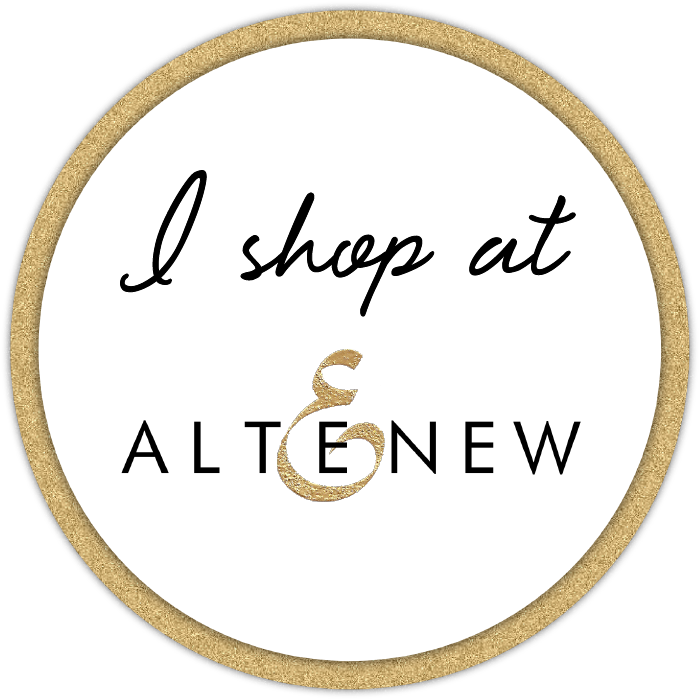 I can't wait to show you these FUN products and projects, starting now. First up is an adorable little birdie that you've been getting peeks of throughout this release week. This cutie, along with the two sentiments, are from LS Exclusives: So Tweet with Evelin T Designs. The two panels with a dotted edge are from Essentials: Katharine. The elements are all colored with copics, with a bit of purple distress ink blended to tie the bird and sentiment together. 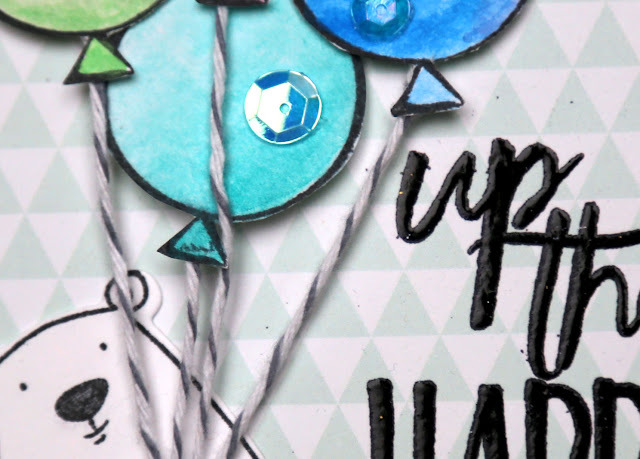 I originally created this card for the Winnie & Walter Over the Edge Challenge, stamping the balloon over the top of the panel's edge to give the feeling of height. If you get a chance, check out this challenge and all the others. 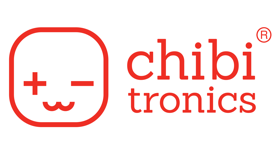 There's a $75 gift card up for grabs at EACH challenge! But hurry, they all close on the 29th. 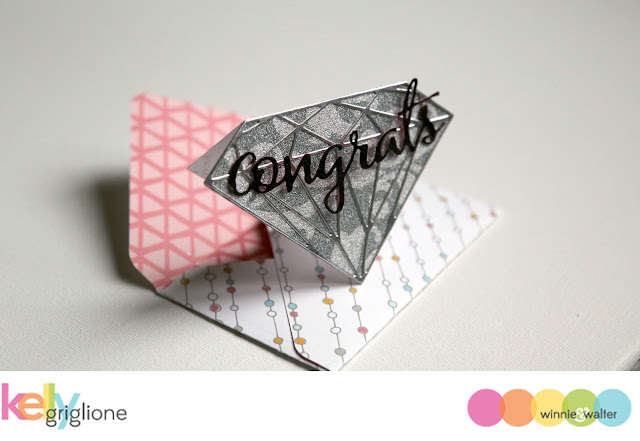 The next three cards all feature faceted dies. 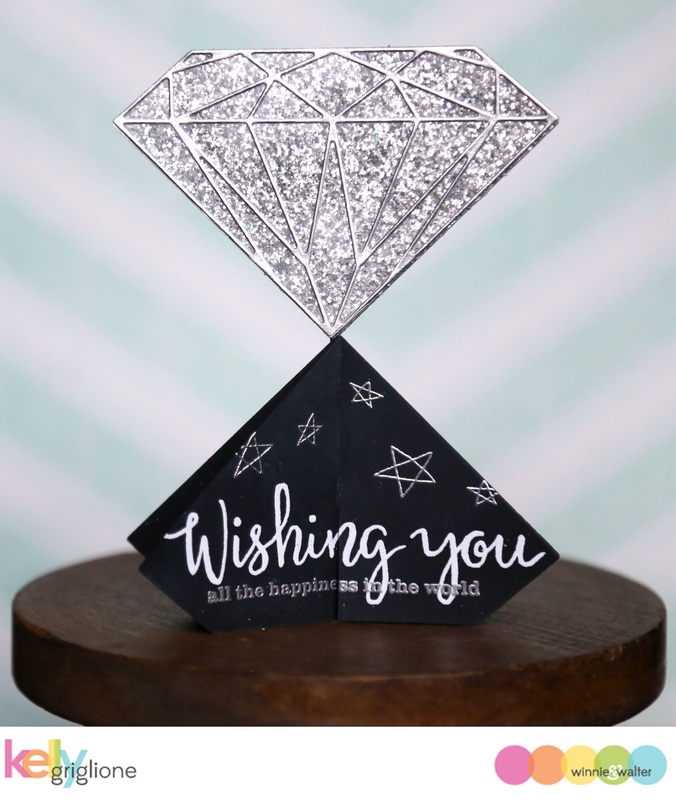 When I first saw the images of this new release, I could not wait to get my hands on this large, faceted diamond, knowing it would be the perfect size to make a shaped card. How awesome that all you need to do is put the die slightly above the fold of your card, run it through the die cutter, and you have a card! To dress it up, I cut the facet outlines out of silver foil for additional shine. 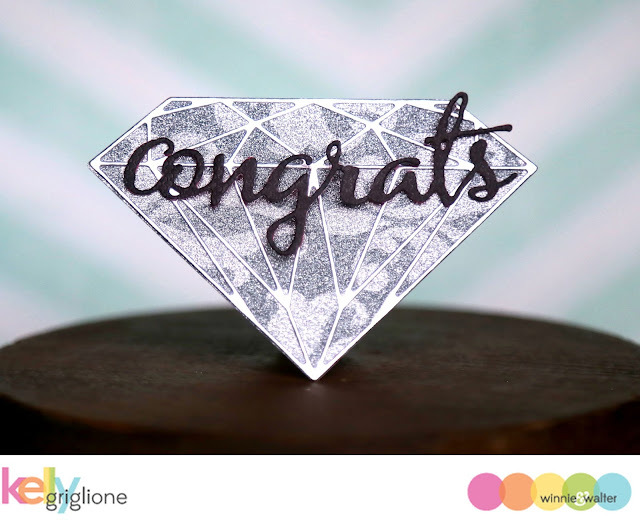 "Congrats" is from The Big, the Bold and You Cutaways. How cute! Cut off the bottom tip of the diamond in the back and this little card stands on its own. Because it's smaller than an A2 card, I made a custom envelope for it. I think any bride-to-be would be delighted to open this up. 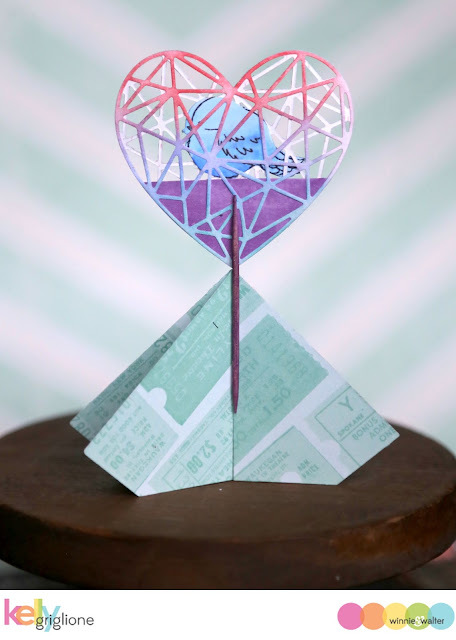 It's another shaped card, AND it's a 3D card. The sparkling diamond is displayed on a base, kind of like in a jewelry store. And the base is ... a diamond! Two solid diamond shapes are interlocked so they can be spread out to stand on their own. On the base, the sentiments in the free-with-purchase stamp set, Wishing You with Evelin T Designs, are stamped right across the two diamond shapes. Here you can see that the base folds flat to fit in an envelope. The next card uses a similar base. I'll explain a little more how I assembled it. It's a love bird in a cage! And the cage is a heart. 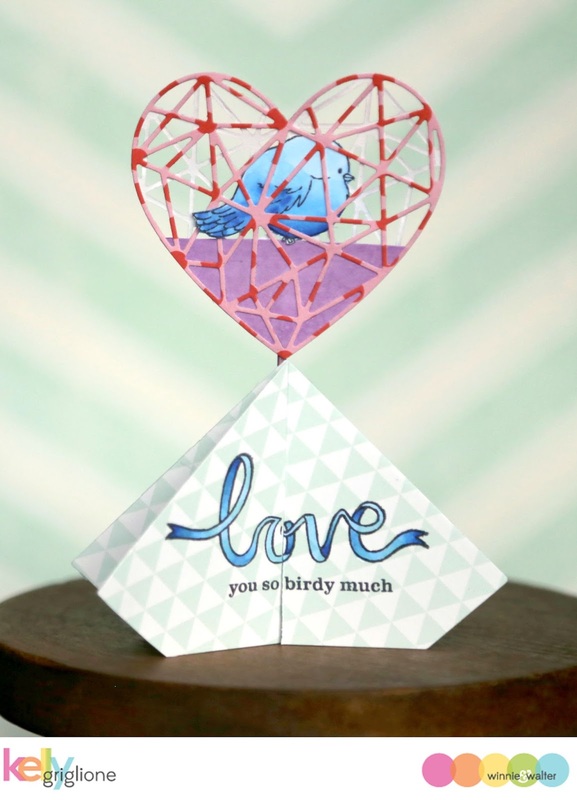 The bird and sentiments are from So Tweet by Evelin T Designs. For the base, I cut a slit from the top to the middle of one diamond, and from the bottom to the middle of the other diamond, slid them together, and spread them out until it stood on its own. By turning one of the two hearts around, you get to see the bottom layer of facets, making this seem even more cage-like. 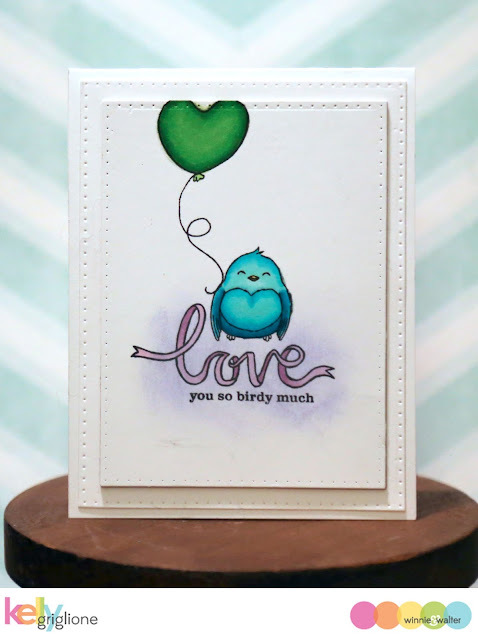 I added a floor for the bird to perch on, and the bird itself (colored with copics) sandwiched in between the two hearts. Here's a rear-view of the card, so you can see more of the mechanics. An old fashioned toothpick! I darkened it with Copics, and then glued to the heart and the base. Like the diamond card earlier, this one folds flat for mailing. Thank you very much for joining the release week excitement! All the products shown are now available at Winnie & Walter. Hi Folks! 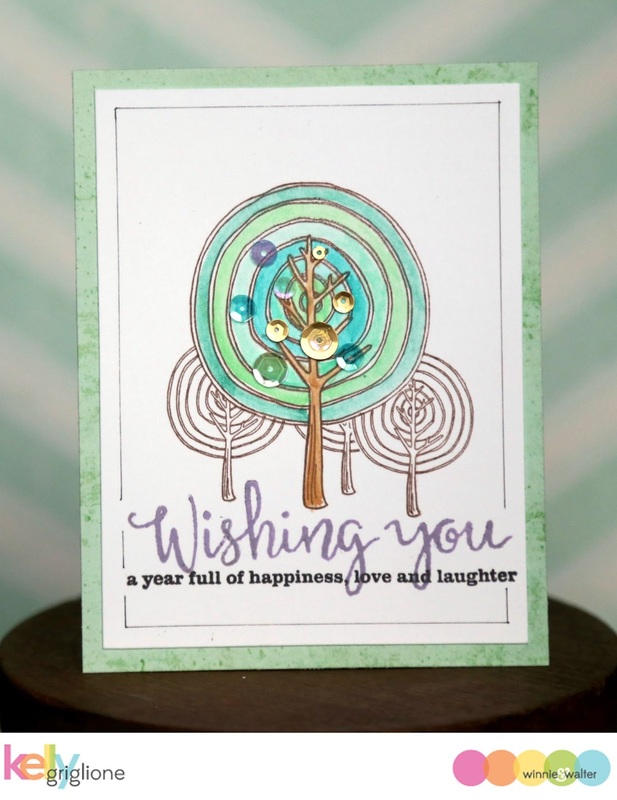 Oh these wonky circle trees ... one of my favorites in the new Winnie & Walter release. They're from the Kindness with Evelin T Designs set, and with a little masking you get a whole, wonky forest on your card. The sentiment is from a free-with-$30-purchase set called Wishing You with Evelin T Designs (this set is one of my new favorites, and I seriously can't believe it's FREE ... wait until you see all the neat sentiment combinations). These wonky circles call for some loose watercoloring. The most fun kind of watercoloring, for me ... who wants to have to stay in the lines anyway?! 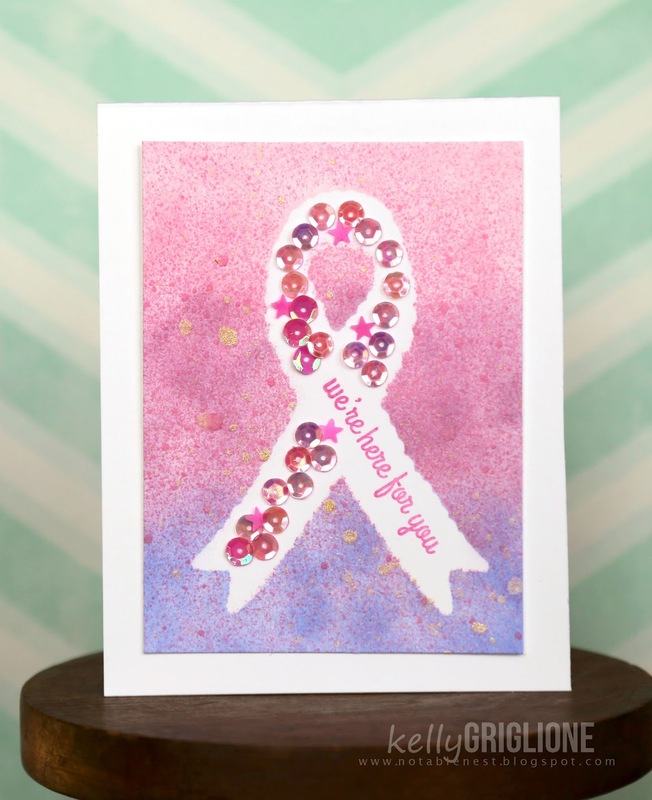 The gorgeous sequins in all different sizes and shapes are from Lucy's Cards (Carribbean Dream, Walter's Sparkly Shaker Selection, and Champagne). Seriously love them! They are my new favorite accent. 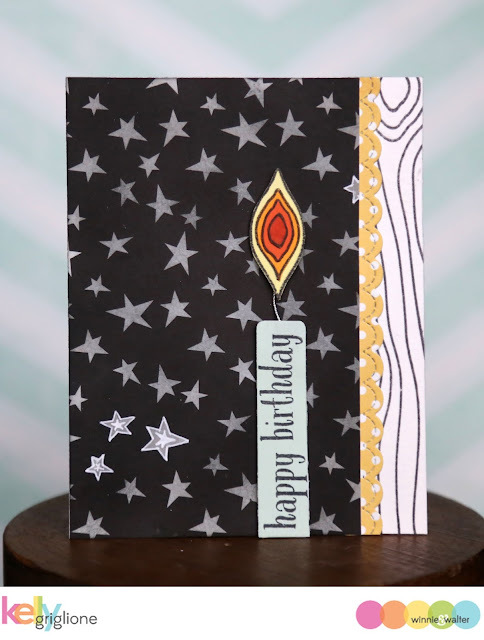 This card uses the Wishing You with Evelin T Designs free-with-$30-purchase set again (different secondary sentiment, AND those cute little stars in 3 sizes). The stars are both white embossed and stamped in white ink for some depth. 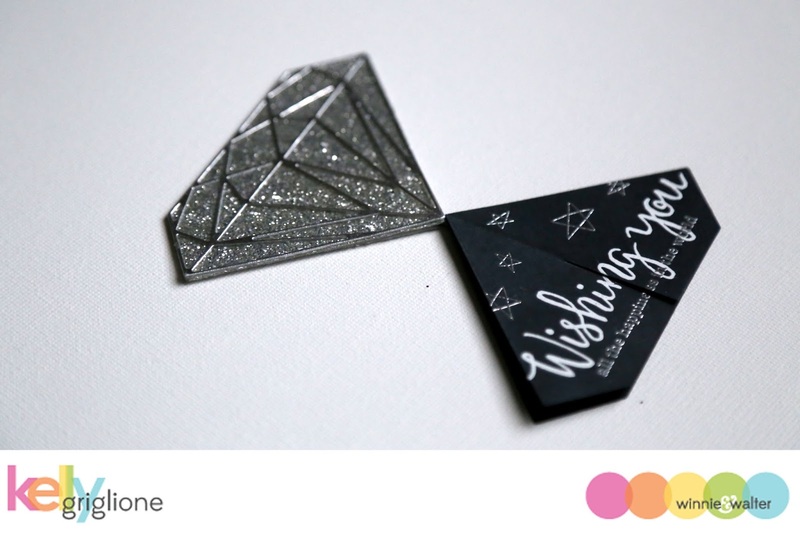 The "wishing you" is actually embossed in silver sparkle, so there is contrast in real life with the white secondary sentiment. Love that the secondary sentiment ties in with the space theme on this card. The splatters are Heidi Swapp Color Shine in white. And of course, there is the moon. A couple layers of my husband's comic book backing boards underneath, some matte silver cardstock, and then a topping of white facets from the True Multifaceted Circle Cutaways. I left some of the white facets in the moon for the craters (or I guess that would really be the ground and the silver areas are the craters). It's a little out there, but I do like things that are slightly different, and this faceted moon fits the bill. I hope you can come back tomorrow, as it's my absolute favorite of the release! I have a 3D project that I can't wait to show you!! Hi folks! 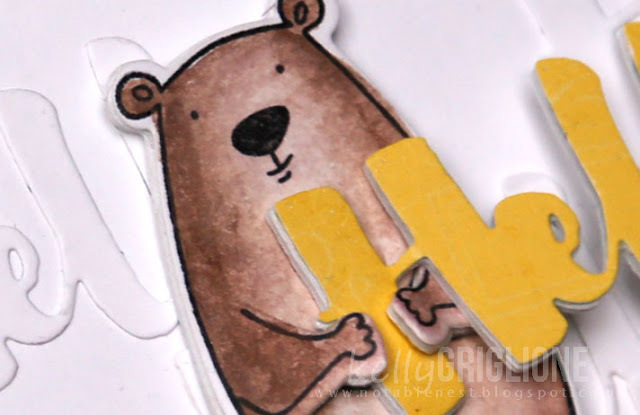 Welcome to day 2 of the new Winnie & Walter release! The Scenery: Into the Woods set has all your wood graining and birch tree-ing needs covered, with large negative and positive versions to stretch the entire length of your card. As large as this over-sized set is, though, I somehow focused in on the small knot in the woodgrain for both of my cards today. Sometimes that's what happens when I stare and squint at sets thinking of how I'm going to use them. I totally saw "candle flame" in that small knot. I stamped that section of the woodgrain in four different colors of orange cardstock, cut them out, and layered them together. For the wick I used a silver thread, which now I see on the enlarged photo that I should have done a better job gluing to the base of the flame! The full version of the woodgrain runs down the right side of the card. For this card, I still focused on that knot in the wood, but only cut one layer for each element. The various sections are watercolored randomly with a tiny brush, and then arranged in a V pattern. 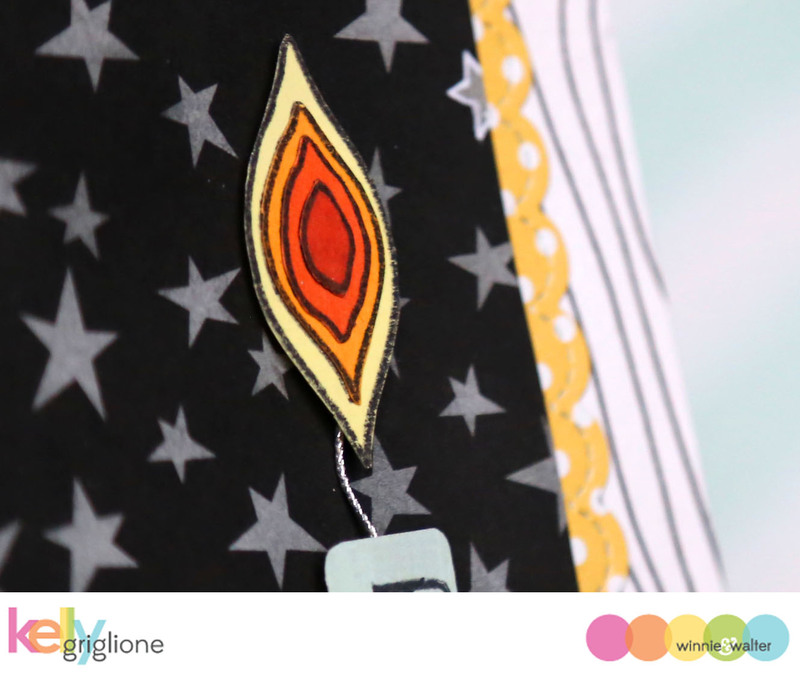 I like the contrast of the bright colors in small doses with the sparkly gold sequins, and the gray distressed paper. The "happy birthday" sentiment on both cards is from an older set called Winter Woodland. Here I bent the sentiments slightly to follow the curve of the paper. We'll be back tomorrow with some more goodies! Hi folks! Welcome to the beginning of a four-day belated birthday release for Winnie & Walter! 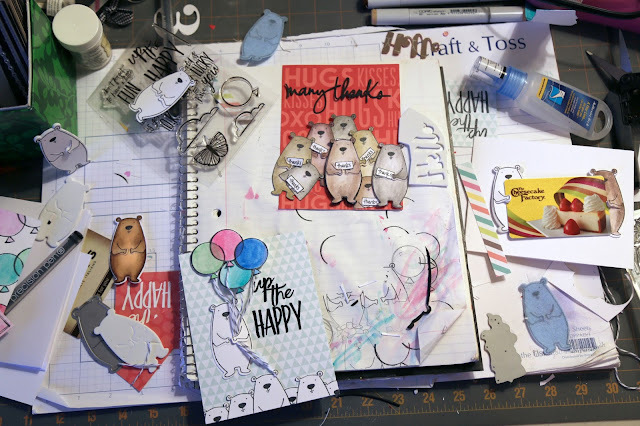 Lots of cute stamps, scripty fonts (of course), fun cutaways, and even a special sequin mix are all part of the party. The In Bloom: Eva's Favorite Flowers stamp set has a ton of different choices to mix and match. The nice thing about these stamps is that, aside from a sentiment, you really don't need anything else to make a beautiful card. This mixed font sentiment is from a set you'll see tomorrow. 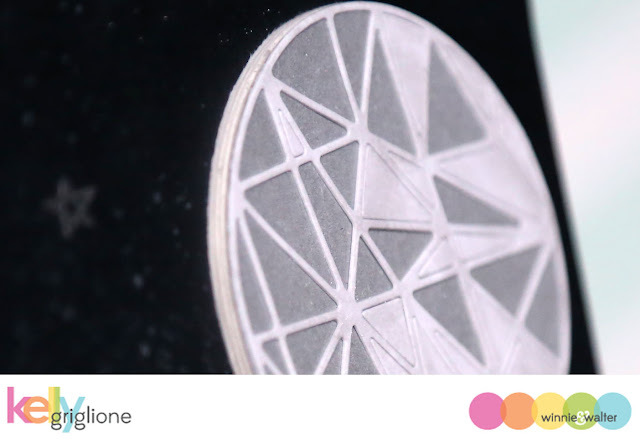 This release also has a creative screening (stencil) called Pattern of the Rings. It would be great to use just a portion of the screening, but here I blended ink over the entire card base to see the full effect (not sure if you noticed, but the first card had edges that were inked though the screening). The In a Word: Kisses Cutaway is very glam in glitter paper, and goes so well with the tiny words from an older set, The Big, the Bold and Friends. The heart behind "kisses" will be featured in the coming days, as well as the stamp set with this adorable little love note envelope stamp. It was so cute, I ended up putting it on a piece of fun foam so it stood out more. Super! The sequins were a surprise gift from the Winnie & Walter ladies to the design team recently. Bags and bags of sequins from Little Things from Lucy's Cafe. I was SO excited! And very thankful to work with such sweet ladies : ) I think every card I've made since then has had these lovelies attached to them. 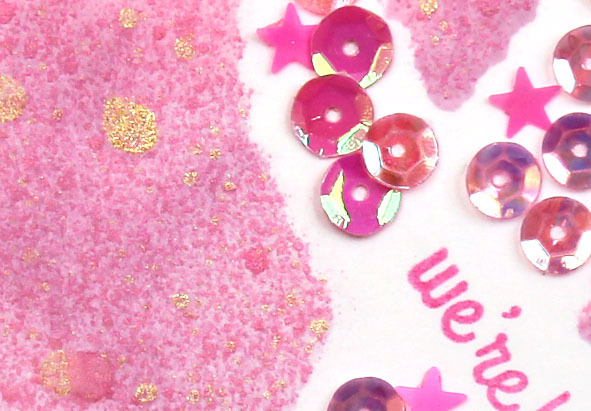 The sequins from this particular card are from the Champagne Sparkly Shaker Selection. I love the different sizes and shapes that come in each package. Be sure to stop by over the next three days ... there is just so much left to show you! Hi Folks! 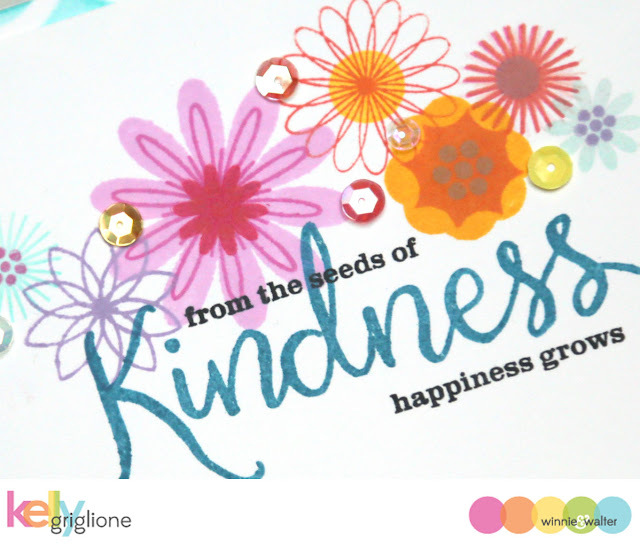 I'm happy to be a part of the CAS-ual Fridays Calling All Sistah's Blog Hop. If you're new to this hop, the purpose is to remind folks to do a breast self-exam on the 17th of each month. So important and takes only minutes! We've all made a card in honor of this hop. 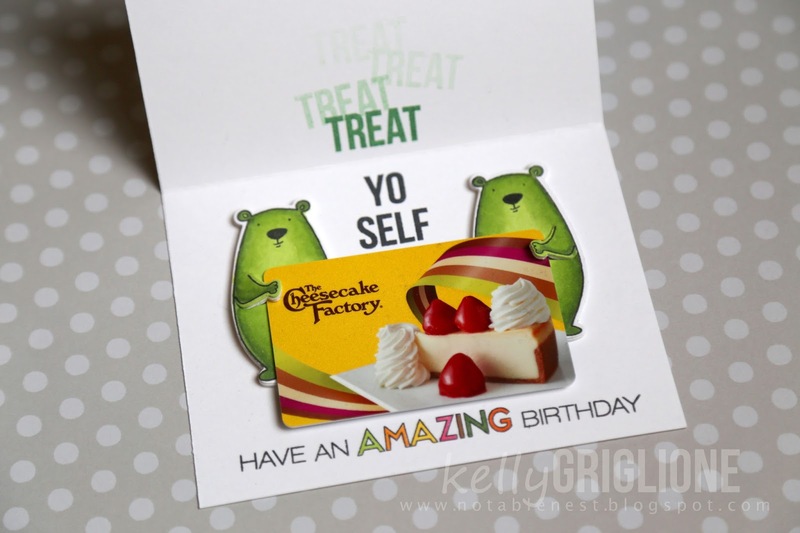 This card uses a mask created from the Ruffled Ribbon Fri-Die to make a negative white space. Distress inks and Glimmer Mist sprays make up the background. I used a sentiment from Hope Ribbon and stamped that in pink. I'm very excited to announce that CAS-ual Fridays Stamps is now an official sponsor of National Breast Cancer Foundation and they will be receiving the 50% profit donation from this collection for 2016. 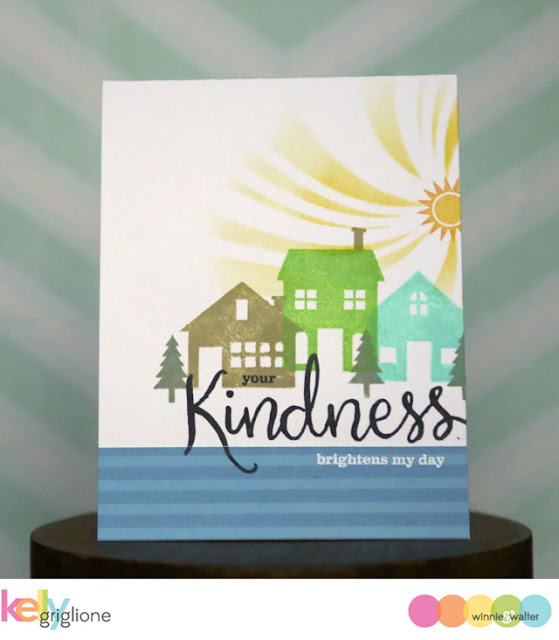 There will be (3) $25 gift certificates to CAS-ual Fridays Stamps given to random commenters from comments left on all the blogs in this hop. Winners will be announced on the CFS blog on Feb. 20th. Your next stop is the lovely Julia! If you would like to start at the beginning of the hop, head on over to the CASual Fridays blog. We also have some wonderful guests from Laura's Loft, an online store carrying the Calling All Sistahs line of products, joining us this month. One last important announcement, you can now receive 15% off any item at the CAS-ual Fridays Store by using the code: KELLY2016. Yipee!! Keep this code handy, as there is no current expiration date for it. Hello, and welcome to the Essentials by Ellen Winter 2016 Hop! I’ll be showcasing several of the new stamp sets and dies on my post today! And, yay!!! I also get to give away an Essentials by Ellen stamp set! 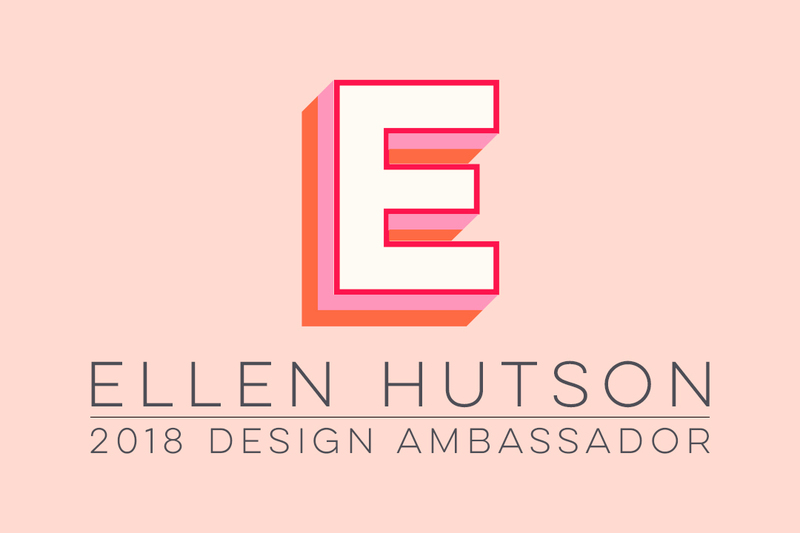 The winner may chose ANY Essentials by Ellen brand stamp set (maximum value $15) currently in stock at Ellen Hutson.com To enter my giveaway, please leave a comment on this post by February 16th! There is also a crazy awesome Grand Giveaway in the CLASSroom! To enter, be sure to leave a comment THERE, also by February 16th; ALL winners will posted at the CLASSroom on Friday, February 19th! 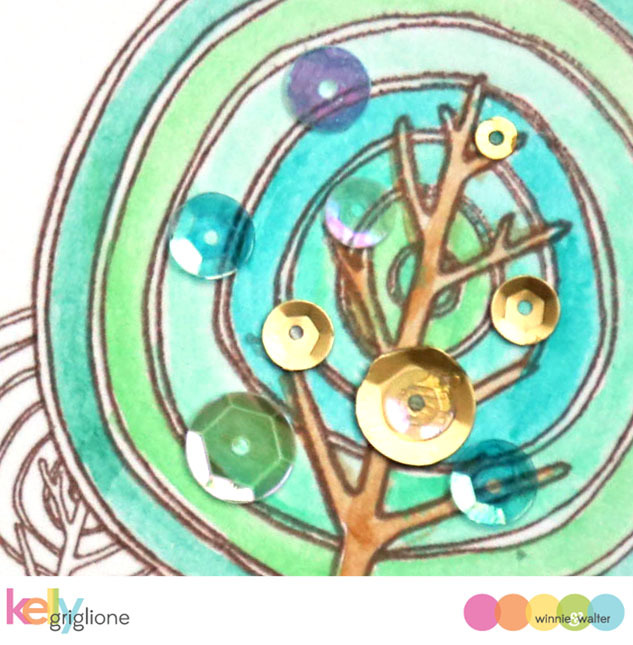 If you get lost, please visit the CLASSroom blog for a complete list of all the designers. Happy hoppin’! You should have come from the one, the only, Julie Ebersole!!! I am beyond impressed with the coolness of her designs in this release. As you will see after reading this post, I am OBSESSED with her interactive bear from the All Inside set. What makes it so special is that the die actually cuts his hands! That means you can make him do a ton of things. So let's get right to it! 1. Give him an embellishment. Here the bear is hanging on for dear life as the balloons whisk him away to "happy" : ) Adding actual balloon strings adds another texture to the card, as well as an easy way to have the bear hold the balloons. 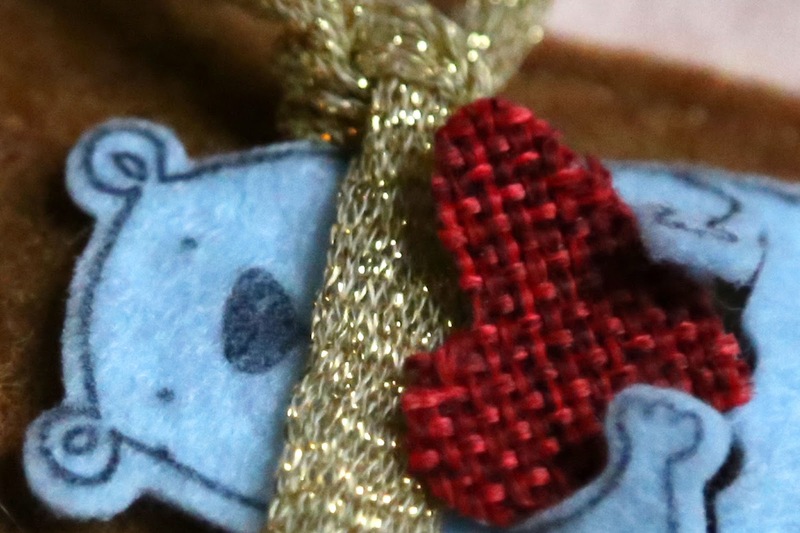 I didn't adhere the strings to the bear, just slid them under his die-cut arm. 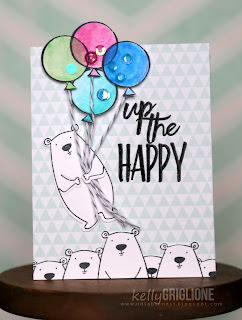 The sentiment and balloons are from another set called Up the Happy. I wanted the sentiment to really stand out since it tells part of the story, so I embossed it with black powder instead of just stamping it in black. On the left is the original version of this card ... can you tell what I ended up changing? 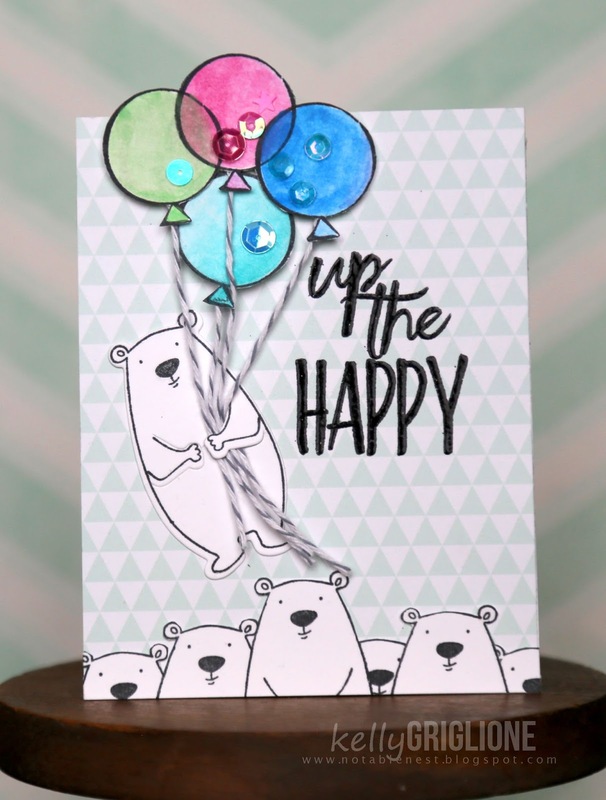 The crowd of bears on the original card is very compact, and doesn't really give you the impression that one bear is getting carried off by the balloons. Plus the taller bear in the middle of the crowd was competing too much for the focal point. 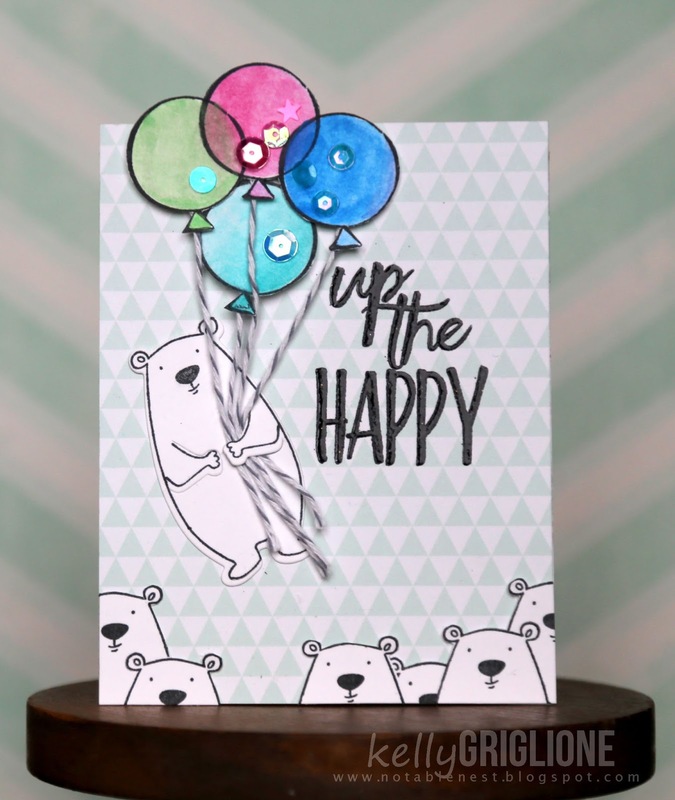 For the final version of the card on the right, you'll see that I split up the crowd of bears so there's a space where the balloon bear would have been standing, before he got a hold of the super-charged helium balloons. And your eye goes right to the balloon bear, not to some attention seeker in the middle of the crowd below. 2. Give him a sentiment. Oh yes, the cutest bear ever can hold any sentiment you want him to. 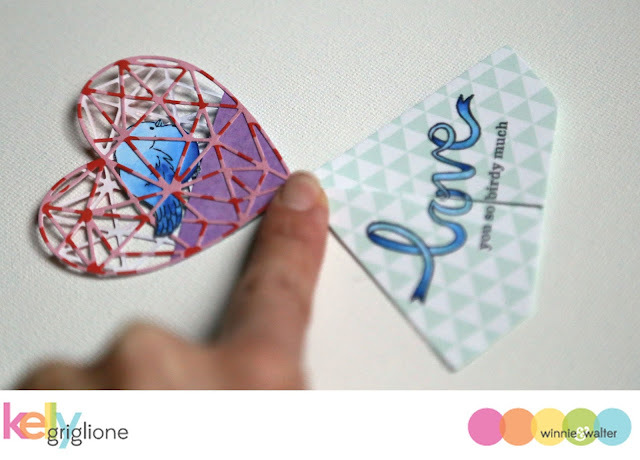 Isn't that so much more fun than just sticking the sentiment on the card base?! 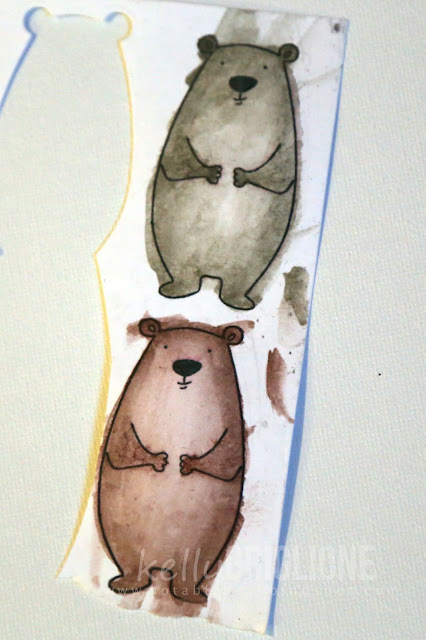 Speaking of the card base, I cut several more of the Brushstroke Hello dies in white to make the base a little more interesting, clustering them on the bottom of the card to help ground the bear. Here he is, with his chubby little hands grasping the sentiment. Aww! Both the bear and the sentiment have a layer of white fun foam underneath to make them thick and substantial. 3. Cut him from felt. Really, a whole different world opens up when you start thinking beyond paper. I had my grade-school-aged cousins over for a party last week and they all went NUTS over this cutie in felt! They wanted to make him in all different colors. This project is the cover of a prayer journal from a women's group I just joined. The bear is glued down, with some stuffing inside to make his belly round. 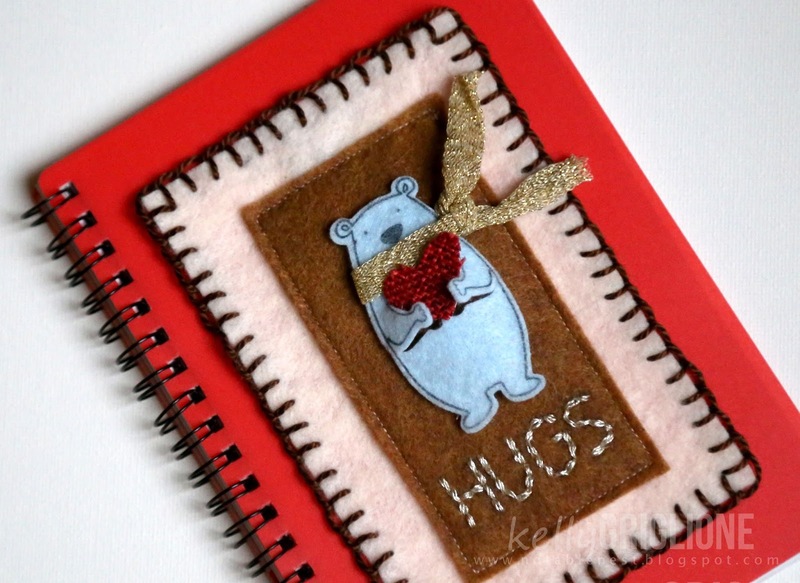 I stamped the "hugs" sentiment and then stitched over it with metallic thread. Then the brown panel is sewn to the peach panel, which has a brown blanket stitch along the edge. I wasn't sure how to attach it all to the plastic notebook, so I finally ended up using my tiny attacher and stapled underneath the brown felt edge. You can't tell it's there. And did you know you can stamp pretty well on felt?! Yes! I like to use StazOn because it gives a darker impression. All these textures make me so happy! 4. Stamp multiples of him. What a great way to get more out of your stamp and die sets. Instead of one bear, why not make eight of them?! Multiplying something is an easy way to make it look more impressive (a common interior design trick as well). 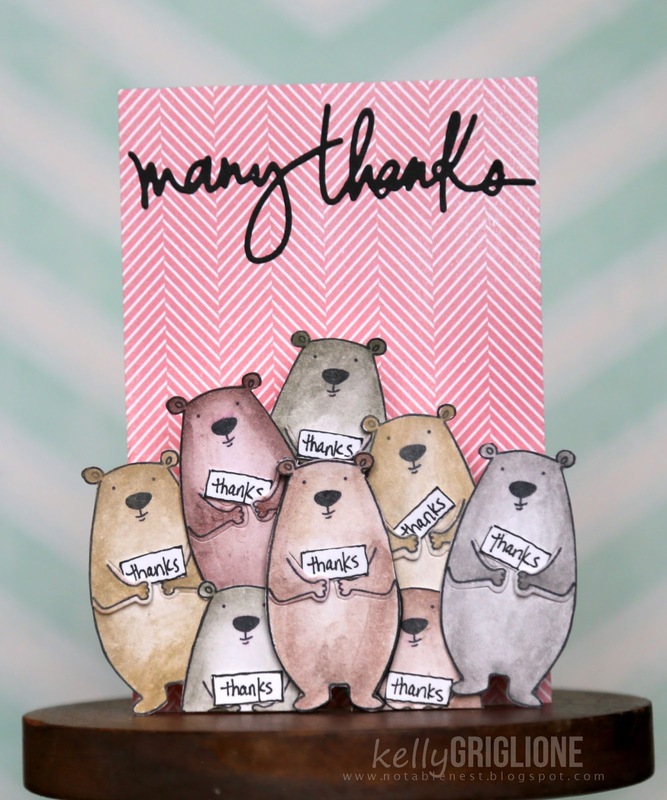 I picked the Many Thanks die specifically to go with this gang of bears. Thinking more about the sentiment, my husband suggested I decided they should literally be holding many thanks. Not having a "thanks" stamp in the right size, I just wrote them out and tucked them into the bears' paws. This card is made a little differently, with a flat panel for the back and a main focal point that swings out (folds back flat for mailing). One tip is when you know you are going to fussy cut around your image anyway, go nuts and color outside the lines. Way outside. It doesn't matter! You would never know there was all that mess before their trimming. 5. Give him a Gift Card. 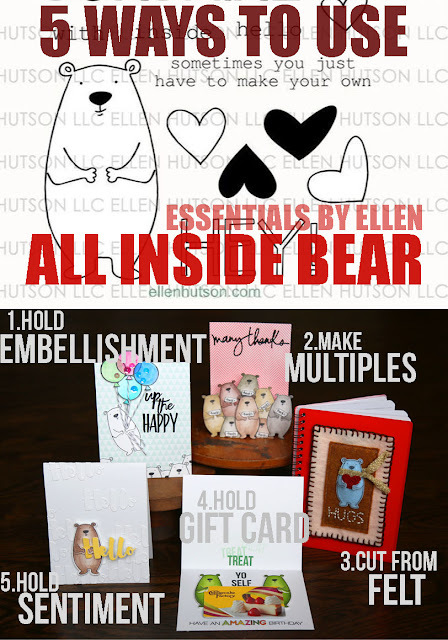 Yep, use two of these bears for a fun and unique gift card holder! 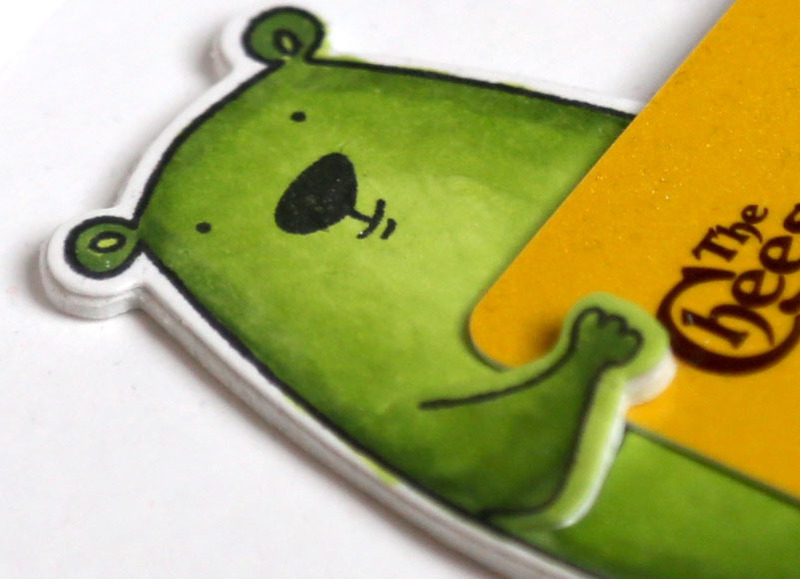 You may be wondering, "why green bears?" Well, I wanted them to tie in with the colors on the gift card. Same thinking for the sentiment on the bottom from the Totally Awesome set ... the "amazing" is colored in with colors from the gift card. That sentiment cracks me up. "Treat Yo Self." hahaha! 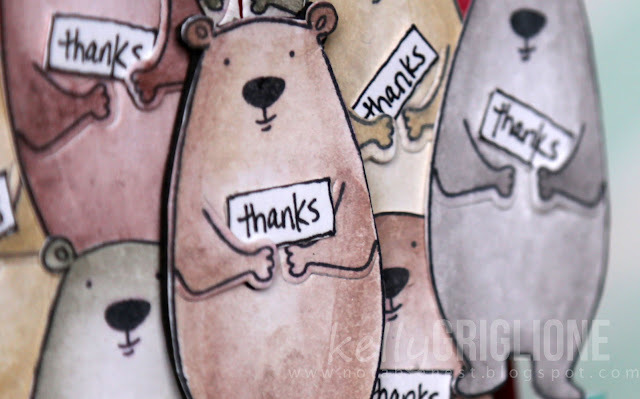 To make the bears into a gift card holder, just space out the bears and slip the card in. I just love him in green with the white fun foam underneath. And I love his quirky smile. He's all, "Yeah, I've got a gift card for you. I know you love it. I know you love me." "so, what's with all the bears?" I just completely fell in love with this guy! I'm sure your mind is thinking of a million more ways to use this little guy, but here are five of them. So versatile! Thank you so much for stopping by, and I hope you are as excited as I am about the new goodies in this release (not to mention the prizes!) To somewhat quote Virginia Lu from my facebook page, waiting for this release has been simply "unbearable"! Your next stop in this star-studded hop is Sharon Harnis!